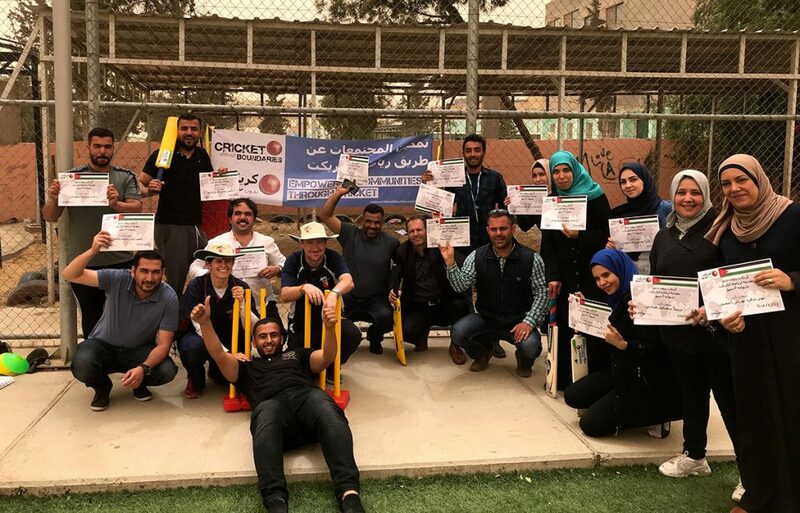 The end of our trip to Jordan provided an opportunity to begin the journey to sustainability with Coach Education sessions with UNHCR and Right to Play. I think it is safe to say that in Abdul and Thambi from UNHCR we have found a pair of new CWB heroes. Their role at UNHCR is to facilitate activities and services for communities, and it is clear that they are hard working, dedicated, and passionate about improving the lives of others. Today we had the chance to spend the whole morning with them as they helped us run coach education for community leaders from the two community centres we have worked at in the Mafraq region. We started in our typical way; setting up a game of pick-up cricket and slowly feeding people in to the different roles – batting, bowling and fielding, before introducing the coaching method of slowly adding technical information, making sure everyone had plenty of goes, and testing of skills at the end with some competition. Moving on to explaining the adapted games it was a great sign for the sustainability of the project when, after setting up 3-2-1 Go! we were able to turn to Abdul, hand him the bat, and ask him to explain the game to the rest of the group, which he did effortlessly. The game that ensued was incredibly competitive, and it was great to hear the new coaches latch on to the collaboration and team work necessary to succeed in the game. Between the two of us we have spent some time thinking about how to evolve the CWB “Introduction to Cricket” coaching course to take into account the integrated learning activities, and this panned out very well today; we played “Team Targets” (essentially hand hockey) and, at the end, asked the group to think about how they could “aim” to use the games in the community. The ideas that came back were excellent, from adapting games for developing literacy to talking about gender-based violence to release of frustration and stress. It was wonderful to have such an engaged group, and the fact that they were already setting up a WhatsApp group for share ideas by the end of the session, with our resident Arabic speaker Jamie added to relay messages back to the rest of the team, was a good sign that there was real buy in to cricket and its potential as a catalyst for positive change. 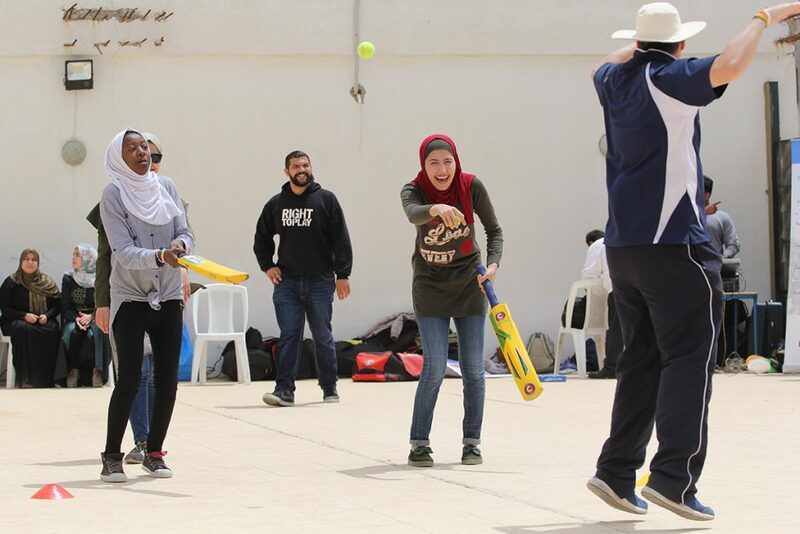 The following day working with Right to Play we were supported by the equally magnificent Hazem and Ahmad; smart, funny and very experienced, they worked side by side with us as we introduced cricket to community leaders in the Palestinian refugee camp just outside of Amman. The narrow streets packed with cars, donkeys and fruit and veg stalls meant we arrived later than planned but we still had an hour to run through the basics before the leaders would support us in a play-day with local children. The community centre play space was a tiled roof 2 floors up, and overlooked by curious neighbours we set up the stumps and laid out bats ready to play a quick game. For these leaders it was the very first time they had played cricket, so it was a fairly magnificent moment when, after being shown how to bowl, the first delivery of our pick up game was delivered with a straight arm, and then slapped through the off-side for a quick single. As the DJ cranked up the tunes we proceeded to run through the basic skills in a relay and a quick game of 3-2-1 Go! before over 100 children poured out to join in the fun. These brief accounts give a flavour of the sessions that we delivered, but there are clearly a few common themes. 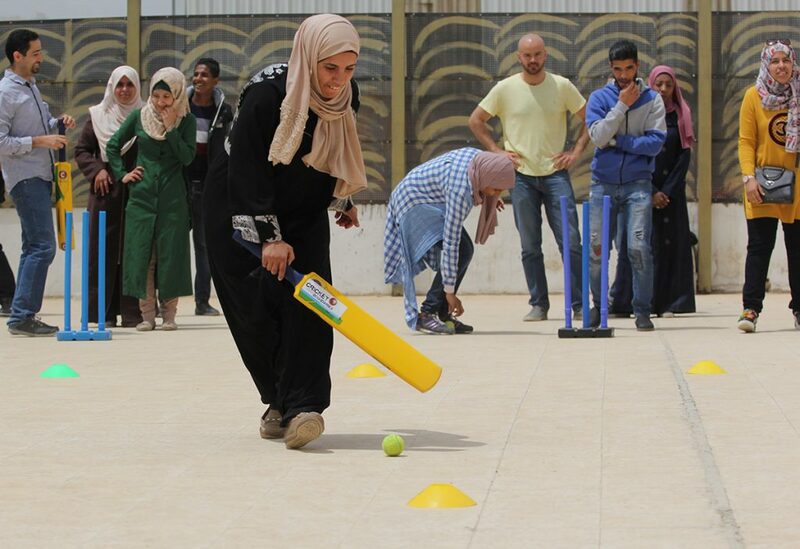 That the leaders we worked with were brought in to the idea of using cricket games to support the children they work with, and that they have deep wells of creativity, thought and imagination to take the activities we have shared and run with them. We’re excited to see what these games look like as they evolve and develop in the hands of these great leaders.